The traditional story of Jesus' birth is well known and beloved. A long journey from home. A pregnant mother. The crisis of birth. Remarkable visitors. But there is more. For the first time, Kenneth Bailey provides a drama that accurately presents what the Bible actually says rather than what tradition and mistranslations of Scripture have portrayed. Pastors, Christian educators, musicians and others will welcome the opportunity to present to their congregations this drama of hospitality, grace and joy. The five original contemporary folk songs for guitar and one (SATB) choral anthem you find here give the production delightful musical accents. Each song on the CD is performed twice, once with vocals and once with accompaniment only for use with back up singers in live performance. Without music, the drama takes 25-30 minutes while lasting 45-50 minutes with music included. Worship leaders and musicians can find the music performed here in the Open Hearts in Bethlehem: Musical Score&-also available from InterVarsity Press as a PDF download. This fresh drama is biblically accurate, heartwarming and perfectly suited for church performance. 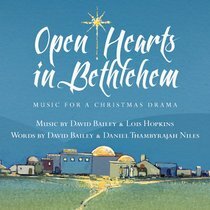 About "Open Hearts in Bethlehem Music (Cd)"
David Bailey is a composer who toured as a professional musician until his death in 2010. Lois Hopkins is a composer and music educator living in New Wilmington, Pennsylvania.